This highly practical diagnostic tool is an indispensable resource for both the office and the noninvasive cardiovascular laboratory. The accompanying CD contains images and video-clips displaying the dynamic aspects of vascular pathology to aid diagnosis and learning. Each image can be enlarged to enable the user to fully discern the main features, and for ease, the CD can be searched by image type, condition/disease or techniques. Part I: Principles and Instrumentation. Chapter 1. 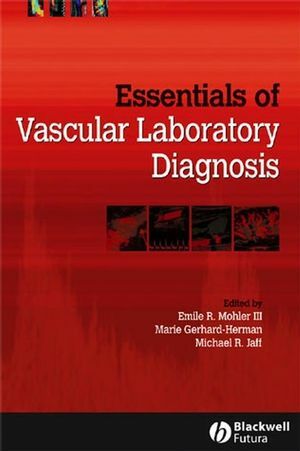 Principles of Vascular Laboratory testing (Marie Gerhard-Herman). Chapter 2. Instrumentation (Michael R. Jaff and Emile R. Mohler III). Chapter 3. Neurosonology (Eric Edward Smith, Karen Lisa Furie, Ferdinando S. Buonanno, Madhu B. Vijayappa and J. Philip Kistler). Chapter 4. Extracranial Carotid and Vertebral Artery Evaluation (Marie Gerhard-Herman). Chapter 5. Thoracic Aorta Imaging (Paul A. Tunick and Itzhak Kronzon). Chapter 6. Abdominal Aorta Imaging (Emile R. Mohler III). Part IV: Renal and Visceral. Chapter 7. Renal Artery Duplex Ultrasonography (Michael R. Jaff). Chapter 8. Visceral Duplex Ultrasonography (Thanila A. Macedo). Chapter 9. Segmental Pressures and Pulse Volume recordings (Emile R. Mohler III). Chapter 10. Peripheral Arterial Ultrasonography (Marie Gerhard_Herman and Emile R. Mohler III). Chapter 11. Thoracic Outlet Evaluation (Edward Y. Woo, Julia T. Davis an Jeffrey P. Carpenter). Part VI: Acquired and Congenital Malformations. Chapter 12. Complications of Femoral Arterial Vascular Access (Itzhak Kronzon and Paul A. Tunick). Chapter 13. Doppler of the Hemodialysis Fistula (Mark E. Lockhart and Michelle L. Robbin). Chapter 14. Upper Extremity Venous Ultrasonography (Marie Gerhard_Herman). Chapter 15. Lower Extremity Venous Ultrasonography (John Gocke). Part VIII: CTA and MRA of the Vascular System. Chapter 16. Computerized Tomographic Angiography (Corey K. Goldman). Chapter 17. Magnetic Resonance Imaging (Sanjay Rajagopalan). Appendix 1: Appropriate ICD-9 Codes for Vascular Laboratory Tests. Appendix 2: Example of Venous Duplex Protocol.